Ex-maid of honor Eloise - having been relieved of her duties after being unceremoniously dumped by the best man via text- decides to attend the wedding anyway only to find herself seated with 5 "random" guests at the dreaded Table 19. Table 19 is directed by Jeffrey Blitz and was released on Mar 3rd, 2017. 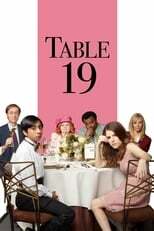 Director Jeffrey Blitz's Comedy & Drama movie Table 19 is produced by Story Ink & 21 Laps Entertainment & was released 2017-03-03.